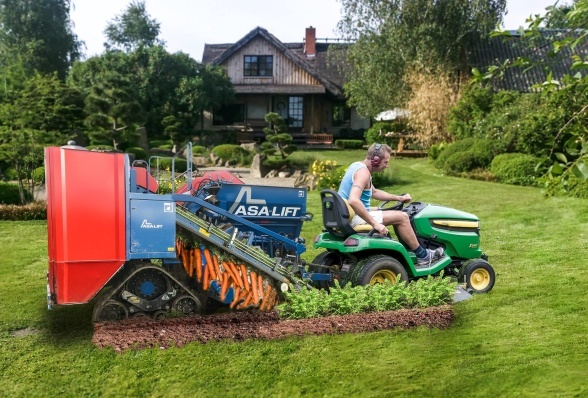 At ASA-LIFT we are expanding our line-up of machines, we feel that every farmer needs the opportunity to use ASA-LIFT products, this is why we are looking into machines for small scale gardens, in particular kitchen gardens. The ASA-LIFT T-12B is our most recent development, build for the vegetable-enthusiast, with capability to be attached on most modern lawn mowers, the T-12B has all the features you know from ASA-LIFT. Most notably is the tracks that we decided to built on to the machine, ensuring maximum grip in even the tallest molehills in your garden. The machine has a small bunker with a capacity of 15-30 carrots (size depending) so that you can non-stop lift carrots out of the kitchen garden bed. The single row toplifter is just as efficient as on our bigger machines, our latest harvest measurements showed results of 7.5 seconds from start to finish per row – lifting carrots for your dinner is going to be a breeze with this machine!